this is what i did last week: have you ever noticed that i try to strategically take pictures so that i don't show you this area? well there's a reason. first off the red table bugged me...never liked the red it turned out in the first place...and well, what can i say? uh... i've been busy creating and making things and never had enough time to clean up (so i keep telling everyone and i'm sticking to that). instead i was stuffing and pushing anywhere i could find a slot. remember how i said i'm adding more white? well here you go. my first wave of white completed. and now i can hide crap under the skirt and not feel bad about it...AND it also serves the purpose of a FORT for clone troopers, a CASTLE for tea parties, and a HIDING place for wild jungle beasts (aka the cat). who knew. How did you attach the skirt to the table? I love the new look! wow it looks great! A place for everything and everything in its place. You've done a fantastic job! Wow...it looks great! Very welcoming and it must be nice to stare at the stash while you create. I absolutely HAVE to get my sewing room organised. Yours looks amazing. Very inspiring. Think I'll go out tomorrow and buy some little clear boxes to start getting my fabrics up off the pile on the floor. I am getting ready to move into my very own creation room and couldn't be more excited. It looks great! An inspiration to mess it up again. My experience is that I have to organize it all periodically, but, it never stays that way for long. The white looks very refreshing and completes the picture. I'd be cautious parting that table skirt in the future! I really like how you organized, painted and skirted your sewing area! Now, if only someone could figure out how to make these creative spaces self-cleaning! Wow, put a mirror there, take away the sewing machine and voila! a vanity table. i'm SO happy you did the chair camille style...it SO just goes there!!! And it looks BEAUTIFUL! I am a fan of white too and love the new look...well done. As I type this, my little grandson is playing Legos under my cutting table. Looks fabulous. I just told a friend last night that my stash needs to be organized...seeing yours has motivated me to get on it. Its gorgeous... and that skirted table is awesome.. I would be tempted to have a tea party there myself if that bit of loveliness was in my house. Nice Job!! You've made the space very fresh and inviting. Look forward to seeing it more often! V, please come organize me! All the new whiteness looks great, plus you give little visitors a place to feel special. Looks awesome - doesn't it make you want to spend more time there! Maybe that's wahat I've got to do! Is it wrong that my heart races when I see such an organized area? 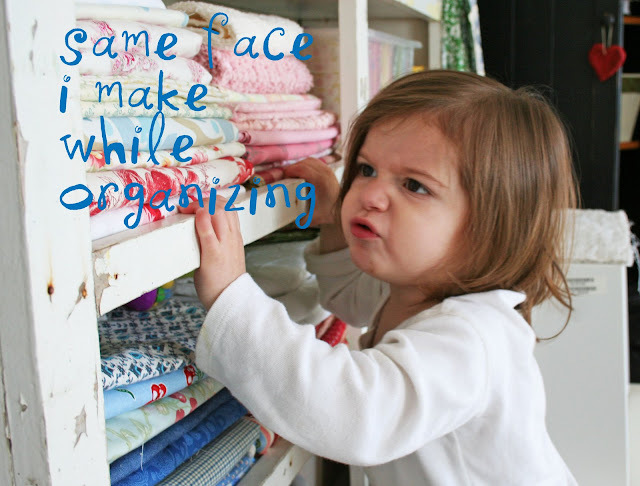 I guess is makes sense though since I used to be a professional organizer. I love the way your fabric looks on the white shelves. They look fabulous with the chair you redid! I need to organize my work/play area, too, so thanks for the inspiration. 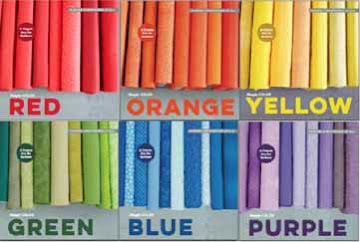 All those fabrics - ooh la lah! Looks great! I should try the same thing...my computer and computer equipment are now on a very-overloaded and very ugly cardtable in my dining room. I should totally "skirt" it! And I'm LOVING how your chair turned out!!! Your posts always make my day! I can see all four of my wild furry animals hiding away from the dog under there. Very clever disguise! Looks great, I drool over all the fabrics! i wish i had a craft area. or any extra area. is there anything you touch that doesn't turn out cute? that looks so good--making your work area look pretty and artistic. did you attach the fabroc to the table with hot glue, or nails, or what? I hot glued some fabric to something once and it all fell off, but I think it's because i used low melt glue and the fabric was a little heavy. Love that. It is your little haven. Do you have your own room or where is that in your casa? Just curious. It looks so sweet. Inspiring. 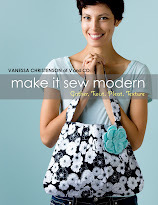 Will you send your daughter over to organize my sewing room?? Beautiful, just beautiful. I can't wait to see what you're inspired to create in your newly organized room. It looks great! Love the white. Love the organizational beauty that it is. Plus who couldn't use another fort, castle and hiding place??? What a great multipurpose table! I love hiding places for my "stuff". Way to go for being motivated to get that done! It looks great! Wow, it looks great! I LOVE that chair! You did a great job on the top of the shelf as well. How did you attach the skirt? Very beautiful! Whoops, sorry about that. You must have been commenting at the same time I was. Oh yeah--the staple gun, why'd I never think of that, even after using it to reupholster all my kitchen chairs? I tell you, things don't connect in my brain. hurray for multi-purpose solutions! it looks great! love it! UGHHHH. I totally need to learn how to sew. this is rediculous. Oh Katie! I loved that face! it's funny, but I make faces when I'm concentrating that really are like that! That looks so cute- it's enough to make me want to take off my closet doors and display all my stuff. 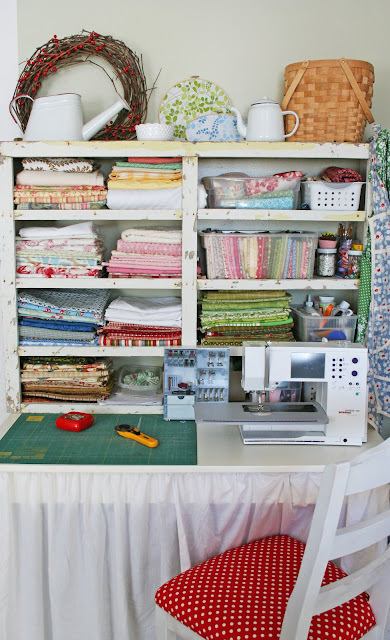 I'm not sure if you have a small house or not, but I think it's amazing at what you do with your space- making a sewing corner look adorable and so many other things! I love the skirt on the table, I want so much to put a skirt on mine but I haven't ever done it. Probably because my table is huge and it would cost me a fortune. However, while reading your post it occured to me that I could use one of my thrifted sheets, it would be a pattern I love and cheap. Best of both worlds! Thanks for inspiring me yet again! V & Co. has been picked and featured as the Best of the Web on the Worthington Wire. You will see your article linked in the Home Sweet Home category today. Feel free to grab a badge to show off that you were featured on the Worthington Wire. It would be nice if there was such a thing as a self-cleaning sewing area! I have been cleaning & sorting & re-organising my studio...seems like a never-ending project! I always love to look at other people's creative spaces so thank you for posting these pics!